The Edmonton Oilers and Hockey Canada have had a long relationship, and few players on the current roster exemplify it better than Jordan Eberle. Eberle was a famous player even before his first NHL game thanks to his exploits at the World Juniors, but he’s been a good soldier at the World Championships, too, joining the team for four consecutive tournaments from 2010 to 2013. 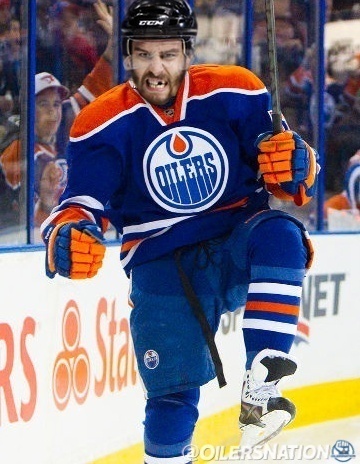 This year, Eberle didn’t go, but that might be for the best. Eberle spoke to reporters in Edmonton on Tuesday, and said that the extra time off made a significant difference for him. Asked if he’d done anything in particular differently this year, the Oilers forward circled back to the extra time off. “It feels like I’ve played in four Stanley Cups,” he added, laughing. There was some criticism of the decision by Eberle and others to sit out this year’s World Championships. There are certainly some positives to playing – one of the most commonly cited being a chance for skaters on non-playoff teams to gain experience in a high-pressure tournament. Eberle, though, has seen his fair share of high pressure situations. Just 24 years old, he has already appeared in 46 games at U-18, U-20 and senior level tournaments for Hockey Canada. From an Oilers perspective, it’s more than fair to wonder how important additional experience is when weighted against the opportunity for a longer summer recuperation. Eberle was also asked about the Oilers’ centre situation, and expressed confidence in Mark Arcobello’s ability to play in the majors. Arcobello isn’t exactly proven, but Eberle’s point is a good one to remember. Arcobello wasn’t shuffled down the lineup because his performance wasn’t up-to-snuff; he was excellent filling in for Sam Gagner but eventually Gagner came back and the Oilers’ coaching staff decided to go with the guy with the long track record instead of the guy who’d been great as a fill-in. 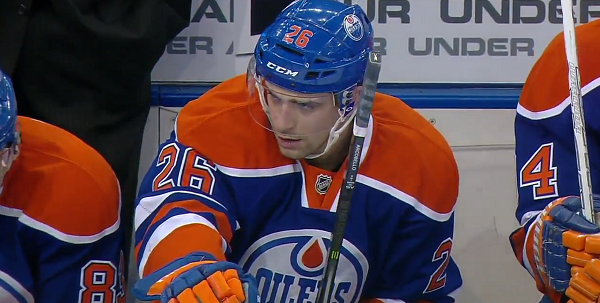 That meant Arcobello got bumped down, and as he could clear waivers, eventually outside the Oilers lineup. I’m not saying I’d feel comfortable with Arcobello penciled into the top-nine of an NHL team I was running (in the Oilers shoes, having just one spot for Arcobello and Draisaitl and whoever else to compete for would be great) but I do think the player did everything that could realistically be expected of him, and then a little more than that. Eberle mentioned both in the scrum and in a separate one-on-one with the Oilers’ Chris Westcott that one of the things he appreciated about Edmonton’s new additions was the size they brought. Purcell, Pouliot, Fayne, Nikitin and Aulie is a pretty massive group to add to the NHL roster in just one summer. Asked about the hire of analytics guy Tyler Dellow, Eberle mentioned some of the stats feedback the players were getting last year, saying that they saw on-ice scoring chances after each game. It’s no surprise that the Oilers’ coaches were tracking that; it’s a little surprising that it was going directly to the players like that. Talking informally to a high-level coach this summer, he mentioned that while he thought stats had an important place in the game, he didn’t think they were all that valuable to players and that it was up to the coaches to draw the right conclusions and distill them to their charges. Eberle’s comment about Corsi (“I think if you start thinking on the ice, you’re shooting the puck and you think your Corsi’s going up that’s where you have issues”) reinforces for me that raw numbers aren’t necessarily going to help a player with his game. 2014-15 goals projection series: Hall, Eberle, Nugent-Hopkins, Perron, Pouliot and Purcell, Yakupov, Arcobello and Draisaitl, Forward overview, Defence overview. Remember that time Joensuu looked great in pre-season? Yeah. This will be good for motivation. this is the first break they’ve gotten, nuge gets his first off season to train in a long time. Ebs seems excited about the new additions. i remember an interview last year where hall said that they didn’t have the right guys in the dressing room to be a legit team(my words not his but similar). this is the first year i’ve been actually excited for the season. im not expecting a playoff spot but at least we look like an nhl team somewhat. I’m glad they didn’t go and really who cares I never watched one game of the WC’s. Iggy never went and he was always the best conditioned guy on the Flames and very seldom was he ever hurt. We need our guys ready to go right from the get go more this year than ever.